Bond Ladys Corner » NEWS FROM IRAQ » Iraq Dinar & CBI News » The future of the Iraqi currency!! Money, a source and document representing the state, is a symbol and expresses its political and religious system and its own philosophy. In comparison to date writing, documentation across currencies can not be questioned or challenged as a concrete fact and document for a certain period of time. The Central Bank of Iraq issued a new currency of paper and metal, bearing the slogan of the new Republic. New issues of paper currency were issued in 1971, 1973, and 1978. 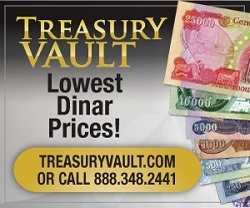 The Iraqi dinar suffered a continuous deterioration in its value after the Iran-Iraq war began, dropping from $3.3 per dinar in 1980 to about $4 in 1988. The year 2000 issued a cash paper bearing the category of 10,000 dinars, and it is noted that all these categories were carrying the image of former President Saddam Hussein. But can such action be implemented? What are the pros and cons of the economic movement in Iraq? Could it really help to reduce inflation rates? Finally, what is the right timing for it? This process is still controversial in the government and monetary circles, businessmen and specialists. We do not deny that the process of deleting zeros is a necessary and important step comes within the need for the country to the process of administrative reform of the currency contribute to reduce transaction costs and cash transactions in the economic process, and reduce the size of the country's monetary mass and help to facilitate calculations and reduce the amplification of numbers, if applied Properly and at the right times. This will be the result of colliding with the value of the new currency after the deletion, leading him to believe that the value of its assets has decreased by dividing them on the three zeros. Timmy What are your thoughts on this article. There does not seem to be any indications of the way we think this will happen just an exchange or maybe double the price you paid for the dinar. So are we all wrong on our thinking of the wealth of the dinar. This is a good read and an opinion piece of course. As the writer speculates the pros and cons as well as the project to delete the zeros, we speculate as well. Even as the other countries were referenced, the situation in Iraq is definitely unique. Because of that, we listen to trusted resources like the CBI and the related ministries as they apply, to name a few, and try to learn as we go. The themes of making sure this transition is as seamless as possible to the people, not too disruptive to the market, all while mitigating the opportunities for criminals is a huge task no doubt. That all said, we can look back and see all of the progress Iraq has made and can confidently see they intend to further grow and mature from where they came from. Your question about their example given at the end is again speculation of continued managed rates through the transition, however long that may be. The bottom line here is the dinar will eventually float free and be affected by the market like most other countries do. The "how " and "when" are the big questions and we just can't foresee that. We just need to watch the news (a huge thanks to Timmy) and do our best to continue to be students of our investment. Here's a fun parting thought that I've shared in the past...let's say the very first move in the rate goes up to a dime. Even though many of us may not choose to exchange our dinar for that, think of how quickly the dinar supply will dry up because of the new demand. That demand could certainly give you an opportunity. Shredd, thanks for your input.....and thanks again to timmie for her unselfish giving of her time to keep us informed. Thank you so much Shredders !!! We so value your opinion. I am having internet issues due to heavy snow on the lines but will try to keep the forum updated. Thanks again all of you and thank you ikea for bringing in news for us !!! Hey Timmy also Thank You for all you do for the site. Bond Lady would be so proud of you for all you for the site. That was a good response from Shredd on the above article. Any comments from your thoughts to this article. I know you have really good comments of the articles you bring in here. Hope you got settled in your new residence in Vermont. tobyboy wrote: Hey Timmy also Thank You for all you do for the site. Bond Lady would be so proud of you for all you for the site. That was a good response from Shredd on the above article. Any comments from your thoughts to this article. I know you have really good comments of the articles you bring in here. Hope you got settled in your new residence in Vermont. Thank you so much Toby, I appreciate your comments as well. I am reminded of a few things after reading Shredds comments. Most importantly that this is a long term investment. We as investors know the risks and so far the risk to us has been minimal . BondLady always said "she was in it to win it " and I am following the path she started. I believe 100% in this investment. Barring any catastrophic event we stand a very good chance in seeing a favorable return on our investment. It takes time to build a country up from the ruins but I am sure the wait will be worth it. I also remember BL saying throughout the years that Iraq shows us daily via the news /gov. sites what they are doing and if Iraq would follow a sound economic policy and see it through then the dinar would appreciate in value. With this new GOI I have hopes that Iraq see's their potential. Hang tight and believe !!! Timmy I too remember her comments that they tell us what they are doing.we just have to keep reading the articles that you so graciously bring in for reading. Did you get much snow up there? Hopefully once this is over and we making some decent money will have the opportunity to get together in person for nice chats of the past events of years past. 11 Re: The future of the Iraqi currency! !